We provide independent advice on mergers and acquisitions, capital raising and asset management solutions to conglomerates, corporations, entrepreneurs and private equity funds. We provide integrated solutions to our clients on a gamut of strategic transactions, including mergers, buy-side and sell-side advisory, leveraged buy-outs and end-to-end restructurings. Our key differentiator is a team rich in buy-side experience in Private Equity funds and Conglomerates across Asia, which has pioneered the Taipan Engagement Model to address the shortcomings of the conventional distributed advisory model. To download our M&A Advisory brochure. Asia with a focus on ASEAN and South Asia. We specialize in identifying new sectors, markets, geographies and companies for you to allocate capital while formulating the most optimum strategy to outperform the market. Our team can comb the market in identifying top-down or bottom-up opportunities as well as execute comprehensive due diligence exercises. Our clients include asset managers, government agencies, private conglomerates and companies. We function as an extension of the Principal’s in-house M&A team partnering across the lifecycle of the transaction from conceptualization to execution followed by the post-merger integration. 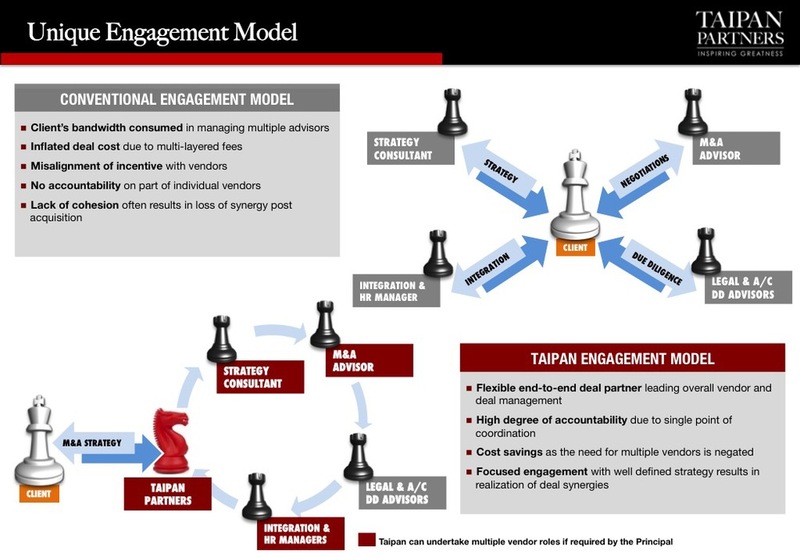 This allows Taipan Partners to participate in the ‘big picture’ and manage the transaction end-to-end thereby freeing up the Principal’s bandwidth to focus on key issues.